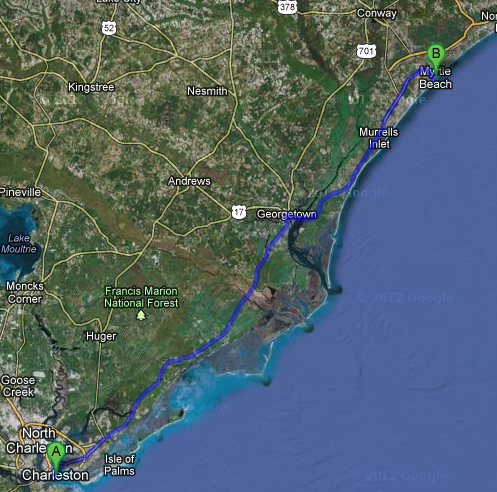 All of the freeways in South Carolina (or at least all of the many freeways we were on) are lined with thick trees and vines and although beautiful and lush, after a few miles, all of those trees become suffocating! I should have zoomed in before I planned this 2+ hour drive! Oopsy. Myrtle Beach is a trip. It is literally a tourist trap - once you are in, you can't get out. And it's so dang tough trying to find your destination for a couple of reasons: 1) typical landmarks one might use like "look for a miniature golf place on the corner" or "there will be a big beachwear store on the corner" are pretty useless because guess what? There are miniature golf places on EVERY corner and giant beachwear shops across the street from every miniature golf place! I am not even exaggerating. 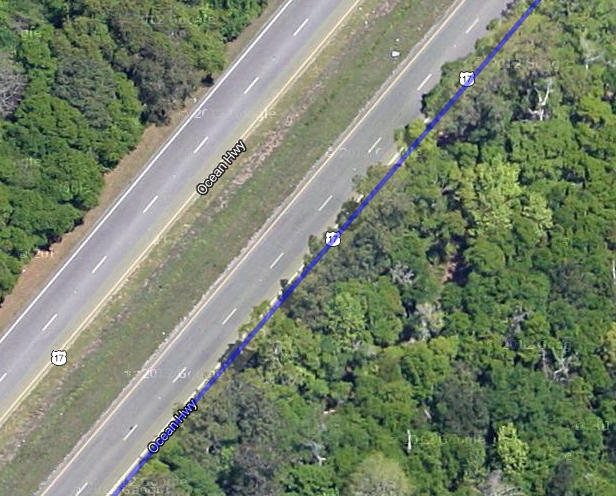 And 2) if you go North on Kings Hwy or South on Kings Hwy, you end up in the same place. No joke!! On our way into Myrtle Beach, we followed my GPS and as we were nearing the condo, I called my dad to tell him we were a few minutes away. 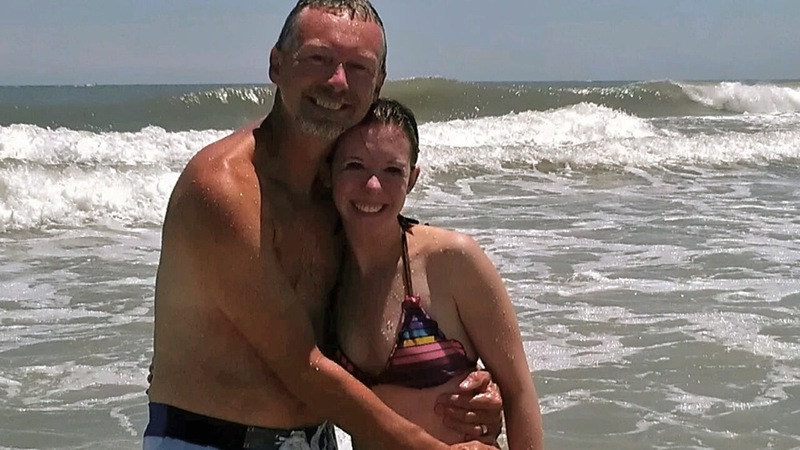 We turned onto Kings Hwy, the main road running through Myrtle Beach, turned right on 33rd avenue, and the condo was supposed to be on the left as we drove down 33rd. 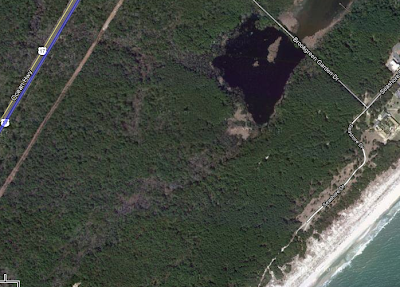 Well, there were a few bungalow houses and then a cross street, Ocean Blvd. But no big, pink condo anywhere in site. My dad said we wouldn't be able to miss it, and that he would be outside looking for us. I went up 32nd, and back down 33rd. Still no condo. I pulled over to check the address in the GPS and my dad told me to make sure that I put North Myrtle Beach and 33rd Avenue South. I did not have the N or the S in there, so once it re-calculated, it said I still had 12 miles to go down Kings Hwy! Argh! Twenty minutes later, we turned right on 33rd avenue again, and sure enough, there was a big pink condo on the left, with the cross street Ocean Blvd! What the heck Myrtle Beach!? But, now for good news you've been waiting for...we made it!!! We left all of the stress of travel behind us and were welcomed by warm hugs, cute accents, loads of pulled pork, ice cold beer and after stuffing our faces we headed to the beach immediately! 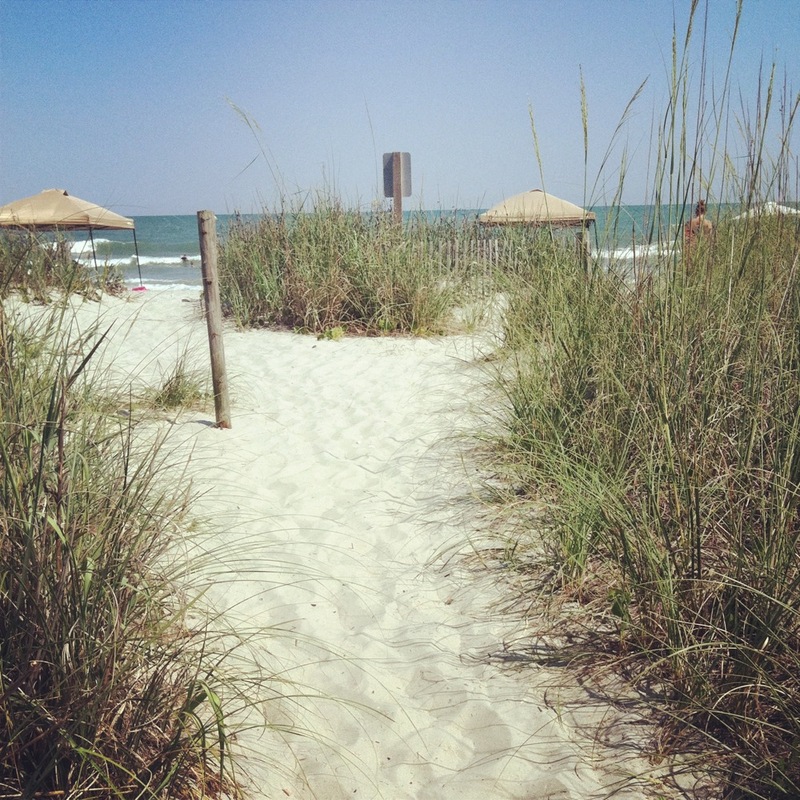 The path to the beach warmed my heart...this is what the beach paths look like in movies! So worth it! 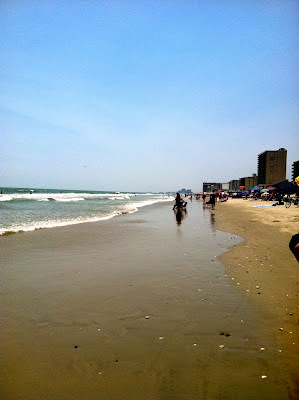 I couldn't resist jumping in the warm water...so happy to finally be on VACAY! Once I got in, it was hard to get me to come out. I can't remember the last time I body surfed and did hand stands in a WARM ocean! I felt like a 12 year-old and loved every minute of it!!! I hadn't seen some of my family in over three years but the good thing about family is that when we reunite, it is like no time has passed at all! 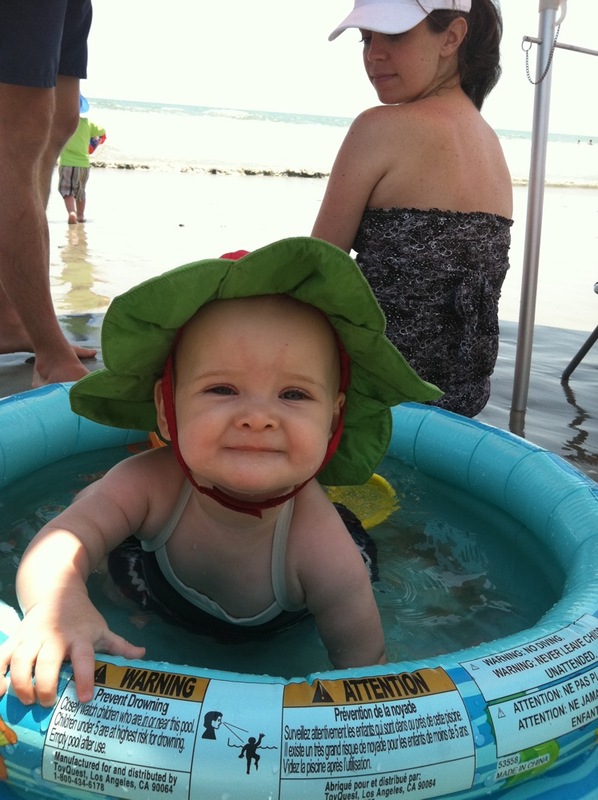 There were also some new faces - like my cousin Katy's new baby Mallory, the sweetest little beach baby. I also met my cousin Chris's youngest, Hewitt. And a lot of wit he has! 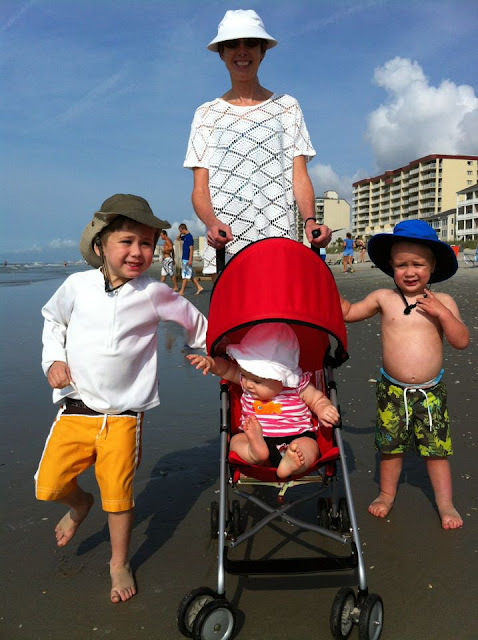 This is a picture of Aunt Laura taking Harrison, Mallory, and Hewitt, for a walk along the beach! And the H's have a new baby brother on the way!